Upper elementary, middle, and high school students with high functioning autism who are at or near grade level can benefit from additional practice, consistent routines, and step-by-step progression of skill development. This book provides strategies and easy-to-follow sample lessons that cover content areas such as talking and listening, reading and comprehending, predicting and anticipating, actively engaging, and organizing written language. 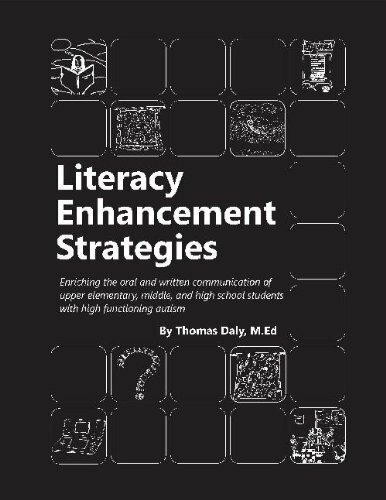 These literacy enhancement strategies are closely aligned with the existing general education curriculum and are linked to students' individual educational goals and objectives. Each chapter contains an overview and theory, a parent letter, goals and objectives, and questionnaires for self monitoring. Also included are suggested teacher directions and discussion topics. Worksheets for students are available as part of the teacher directions and as easily printable worksheets on the accompanying CD. Contains workbook and CD.